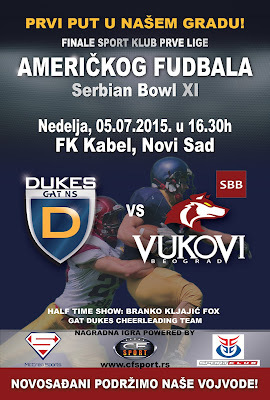 Home SAAF Serbia: Will The Undefeated Dukes Take The Throne From Vukovi? Serbia: Will The Undefeated Dukes Take The Throne From Vukovi? American football is probably one of the most unpredictable game of all sports. After 5 years of trying to reach the championship – GAT Novi Sad Dukes have finally made it. And that's not the only thing they should be proud of. They are undefeated. Yes, they even beat the Belgrade SBB Vukovi. 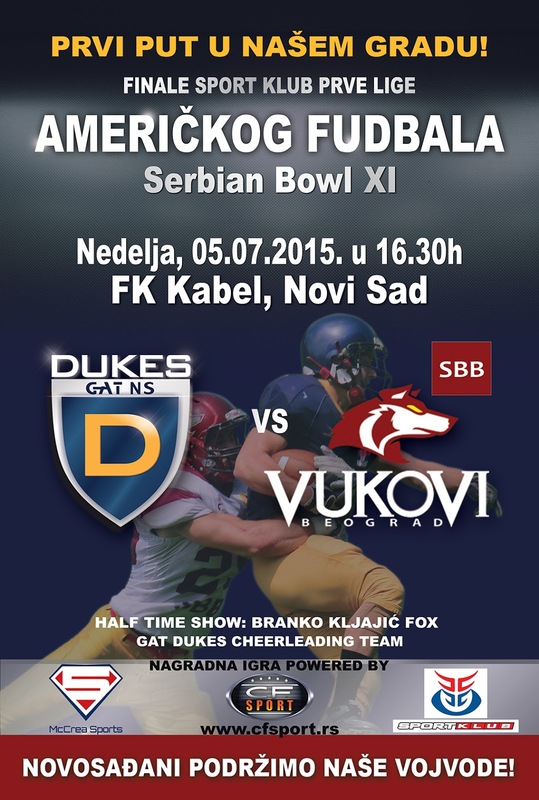 On Sunday, July 5th, Novi Sad will have the honor to host the Serbian Bowl XI for the first time. While the team is gearing up for the championship, team GM, one of the TDEU Heroes, Srdjan Zhan Stanojev, is working around the clock to organize not just a game – but an event. - This is the very first time we're organizing the national championship. And, with that being said, we'll do our best to throw a show for the audience – not just during the match. - says Stanojev and continues – We'll have a halftime show performance by a local rapper Fox, while during the whole game GAT Dukes cheerleading team will be entertaining the crowd. Of course, we've prepared a fun contest for the audience with great prizes. In the last 7 years, it seemed impossible for any team to beat SBB Vukovi and take the throne. Last time Dukes won against the Vukovi was 7 years ago, during the regular season, not counting this season. Will Powell came in to play WR and DB if needed. However, during the regular season game, against Vukovi, Dukes QB Alexander McKean got injured, and he's unlikely to play in the championship. Powell had to step in as the QB. McKean said: Winning a championship takes an entire team. Will Powell is a great Athlete who after my injury has stepped up and lead the team without hesitation to the championship. Obviously we have different strengths but, we were extremely successful offensively prior to my injury by getting the ball in his hands as much as possible, and now he touches it every play, so you do the math. Obviously he's a much better runner than I am and he is a threat to take it to the house on any given play. He even plays defense when called upon. He is clearly the league MVP! We also have added Kyle Theret to the team since my injury (a 4 year starter at Minnesota) who has helped the defense progress and he will be vital in ensuring Vukovi does not score on big plays. With this being the championship, and how important it is to Novi Sad, expect those 2 to play both sides of the ball. Although I am not playing, I will be doing everything possible to assist Coach Adkins and Will throughout the game and obviously anything in my power to bring Novi Sad a Championship. Powell is currently leading the league in TD's, and is one of the favorites for the MVP award. He's very confident about the team and the Serbian Bowl XI - When Coach Adkins, Alexander, and I arrived in February we said we would no doubt reach the championship and compete for titles in both SAAF and CEFL - and look at where we are now. The Dukes have overcome adversity all year - injuries, suspensions, low practice numbers, etc. and I think that can be contributed to both the imports and our core domestic players. We have great team chemistry and that correlates to our success on the field. There is no one else we'd rather be playing than Vukovi for the title and we are undoubtedly ready for the championship showdown. It's time to bring a championship to Novi Sad and Vojvodina - The Dukes will leave everything on the field this upcoming Sunday to make sure that happens. Despite the optimism, Dukes know that their opponent Vukovi is not to mess with. - I can freely say that this year, unlike the previous ones, we have the role of the outsider, which is not a bad thing - all the light and burden of a favorite team is on the Dukes. Our big advantage is that we have a lot more experience in big games/championships. We haven't showed our full potential during the season, and we just might surprise the Dukes. I'm very excited about the finals, and the trophy will go to the team that makes less mistakes and is more cold-headed during the game. - says Mladen Stojanovic, SBB Vukovi lineman. It's interesting to mention both teams have TDEU Hall of Famers – Will Powell [GAT Dukes] and Tony Washington [SBB Vukovi]. Serbian Bowl XI will be played in Novi Sad, FK Kabel Stadium, on Sunday, 16.30h [GMT+2], and SportKlub 2 TV will be broadcasting the match live.